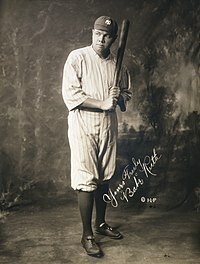 George Herman "Babe" Ruth, Jr. was an American professional baseball player. He was an outfielder and a pitcher. He was born on February 6, 1895 and died on August 16, 1948. Nicknamed "the Bambino" and "the Sultan of Swat", Ruth played 22 seasons in Major League Baseball (MLB), from 1914 to 1935. Ruth won his greatest fame as a slugging outfielder for the New York Yankees. He established many batting records, including career home runs (714), slugging percentage (.690), runs batted in (RBIs) (2,213), bases on balls (2,062), and on-base plus slugging (OPS) (1.164). Some of his records have been broken. Ruth was one of the first five players to be elected into the National Baseball Hall of Fame in 1936. He died of cancer in 1948. Ruth is considered by many to be the greatest baseball player and hitter of all time. This page was last edited on 8 April 2014, at 20:56.